This model of the Polycom Trio 8500 IP/VoIP conference phone is ready to go with the Skype for Business unified communications platform and Microsoft Office 365 Cloud PBX. Polycom Trio 8500 provides a seamless user experience with the familiar Skype interface and features readily available using the 5" touchscreen display. Connect mobile devices wirelessly using Bluetooth or using the USB port. 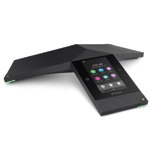 You get Polycom's incredible audio quality, optimized for small to midsize conference rooms. Polycom Acoustic Clarity gives you clear, full-duplex conferencing and Polycom NoiseBlock reduces audio distractions.